00:25:00 Makes 4 servings, 1/4 recipe (260 g) each. Makes 4 servings, 1/4 recipe (260 g) each. This one-pan chicken and rice recipe is a knock-out. With 10 minutes of prep and one skillet to clean, you'll have more time to enjoy our Mexican Chicken Skillet dinner with the family. Heat oil in large skillet on medium-high heat. Add chicken; cook 3 to 4 min. on each side or until cooked through. 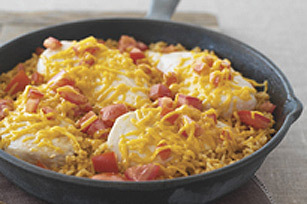 Combine Miracle Whip, rice, broth and chili powder; pour into skillet around chicken breasts. Bring to boil; cover. Reduce heat to low; simmer 5 min. Add tomatoes and cheese; cook, covered, an additional 2 min. or until cheese is melted. Sprinkle with cilantro. Sprinkle with 1/4 cup sliced pitted ripe olives before serving. Serving Size Makes 4 servings, 1/4 recipe (260 g) each.